Foursquare eyes Amazon Alexa partnership as it quietly becomes the go-to data player in tech. Foursquare's headquarters may be in New York, but its location intelligence technology is quietly being built into apps from the biggest players in Silicon Valley. "Foursquare is baked into everything now, and I think it's just the beginning," Foursquare co-founder and executive chairman Dennis Crowley told TheStreet. "Soon we'll be figuring out how to bake Foursquare into cars and into whatever version of the Amazon (AMZN - Get Report) Echo we carry around with us." The payoff has been a long time coming for the eight-year-old company's 250 employees considering work on the location intelligence technology known as "Pilgrim" first started in 2011, three years before it officially launched. The idea behind Pilgrim is that if Foursquare can figure out when phones move in and out of stores, then it can send relevant push notifications to the user. For example, the app now sends users meal recommendations when they enter a restaurant or recommendations for things to do when they travel to a new city. The recommendations are based on the users' history, as well as reviews from other users on the app. The tough part about Pilgrim is that the company had to figure out when phones were entering and leaving places without requiring users to check in. The company finally go it to start working -- and working well -- in 2014, but they kept it for themselves, using it on the Foursquare City Guide App and the company's other more social-focused app, known as Foursquare Swarm. But in March, the company launched its Pilgrim SDK enterprise product, which allows other developers to build their own cool products with Foursquare's "secret sauce technology," Crowley said. In the past four years, the company has been shopping its technology around to other companies, a task that turned out to be surprisingly easy. In an interesting development, Foursquare has found that a lot of companies looking for data or location tech come to Foursquare before Facebook (FB - Get Report) or Alphabet's (GOOGL - Get Report) Google because those two giants are trying to kill those companies who need help. "We're like the independent broker of this awesome technology and you're not tying yourself to Google or Facebook, yet you get these great tools to build competitive products," Crowley explained. The partnerships take different formats, with Foursquare sharing its tech in exchange for exposure, revenue or partnership deals, he explained. Facebook and Google haven't teamed up with Foursquare due to competing products and because the Silicon Valley players have built up their own ecosystems, he said. But that's a rare exception. Snapchat (SNAP - Get Report) , Twitter (TWTR - Get Report) , Uber, and Pinterest are using a version of its geotagging tech. Samsung's (SSNLF new Galaxy S8 phone, launched in April, has Foursquare baked in to tell users where their photo was taken and what it was taken of. Finally, Apple (AAPL - Get Report) is using Foursquare in its Apple Maps product. "We're really excited to do the Apple partnership because that's a big giant that needed our help," Crowley said. 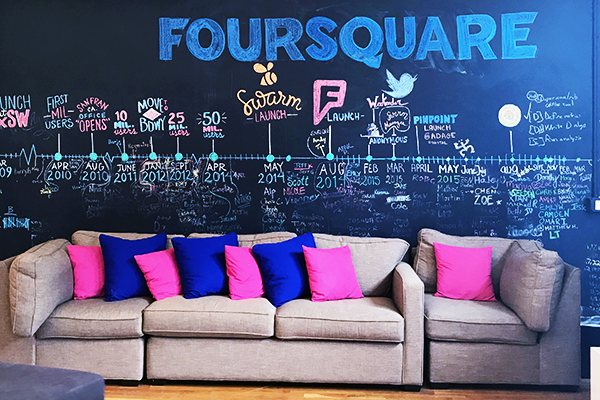 Foursquare's New York headquarters houses 200 of its total 250 employees. Armed with its well-reviewed Pilgrim software, Foursquare has stayed one step ahead, positioning itself to play a role in exciting future technologies, including a portable version of the Amazon Echo smart speaker and future tech-savvy cars that should have Alexa built into them, Crowley noted. Amazon's Alexa is the best digital voice assistant out there, clearly topping Apple's Siri and, at some point, people are going to want to take Alexa with them and have Alexa built into their cars, he said. "I want to use our technology to help things like Alexa or Siri or these other products get smarter," Crowley explained. "Soon you won't just be talking to Alexa at home. You'll be talking to her as you walk down the street." Foursquare can play a big role in both projects because Pilgrim tracks users and learns about their habits, including what restaurants they like and how much they travel, he said. If a version of Pilgrim is built into a portable Alexa, then users can get tips via headphones while walking down the street, such as "Hey Dennis! The restaurant across the street has great reviews." While you may not have time to visit the restaurant right then, you can save the location on the Foursquare app. This same tech could also be in future Alexa-powered cars. When you turn off your car, a screen would pop up showing you ten cool things that are nearby, with Alexa noting the highlights. "It's all about replicating that experience of a friend who knows everything about the city walking around with you," Crowley explained. The company is being proactive, releasing an early version of this technology in Mach 2016 with its Marsbot app that texts you about things in your city that it thinks you should know about based on your history. Foursquare hasn't put a ton of resources into it because it's more like a proof of concept, he noted. But the technology could be in devices sooner than you think -- and without much warning. Crowley said he likes being headquartered in New York rather than Silicon Valley because they can quietly work on exciting new technology since tech is "maybe the seventh most important thing in New York, whereas its the number on thing in Silicon Valley." While Crowley said he likes the less bro-y culture in New York, he also said that he's taken some inspiration from big Silicon Valley names, particularly Google, where he and many of his employees used to work. "Google has an awesome feel to it because there's a lot of smart people there doing a lot of smart things, and that's the feel we like to have here," he said.